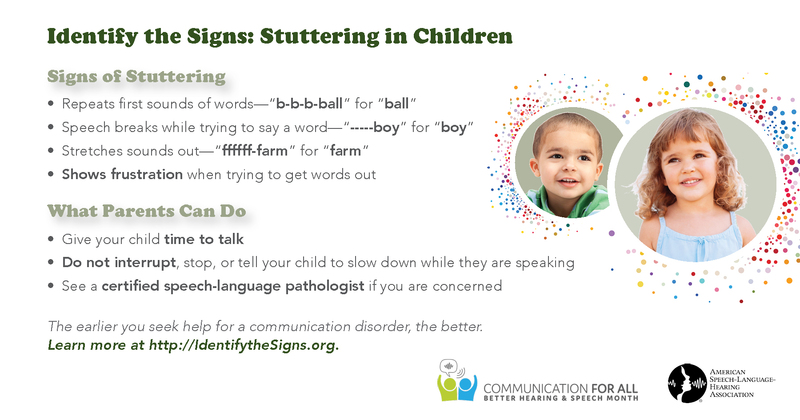 ROCKVILLE, Md., May 1, 2018 /PRNewswire/ -- Results of a new national poll released today by the American Speech-Language-Hearing Association (ASHA) for May Is Better Hearing & Speech Month show a majority of communication professionals say parents are generally not aware of the early warning signs of communication disorders--nor do they recognize the benefits of early treatment. ASHA is releasing a new broadcast public service announcement in conjunction with the results to encourage parents to seek help if they have concerns about their child's speech/language or hearing abilities. 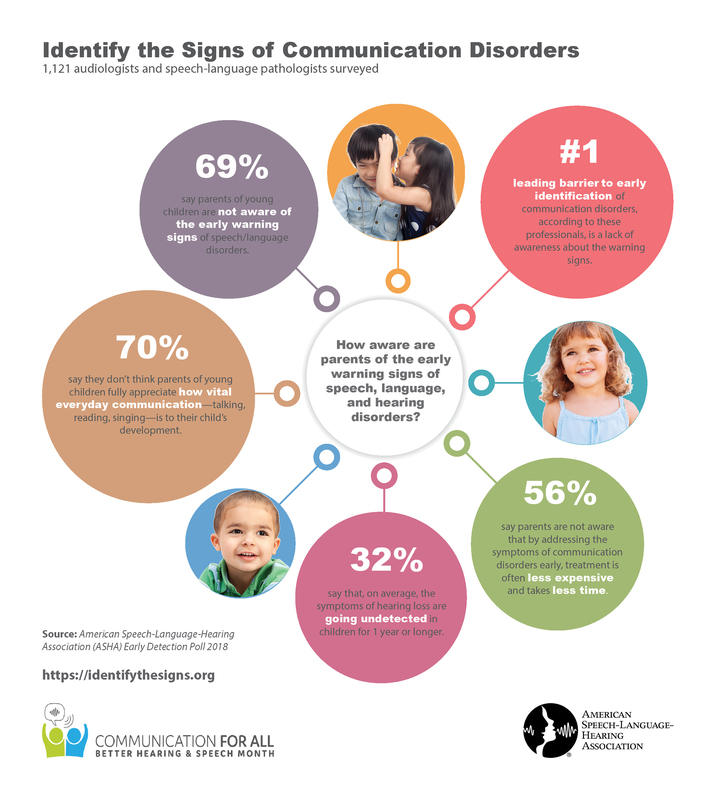 According to the poll of more than 1,100 ASHA members--audiologists and speech-language pathologists--the number one barrier to early identification of communication disorders is lack of awareness about the warning signs among parents (46% said this was the case). A full 69% say parents of young children are not aware of the early warning signs of speech/language disorders--and 32% say that, on average, the symptoms of hearing loss are going undetected in children for 1 year or longer. "Communication disorders are among the most common childhood disabilities--and they are highly treatable in most cases," said Elise Davis-McFarland, PhD, CCC-SLP, ASHA 2018 president. "Yet even with all of the information available to today's parents, our members report they are still seeing children much later than what is optimal for achieving the best outcome." She continued, "We know parents want the best for their children. However, they may hear messages that encourage a 'wait and see' approach by suggesting a child may grow out of a communication issue. Unfortunately, this often is not the case. Delaying treatment means children may miss a critical developmental window where they acquire a majority of their foundational speech and language skills, which occurs between birth and 3 years of age. Hearing and listening to language is the primary way young children learn. The skills achieved during this time lay the groundwork for later success with reading and writing, academics, social interactions, and career options and advancement--making early intervention for any speech/language or hearing problem, preferably well before age 3, so important." 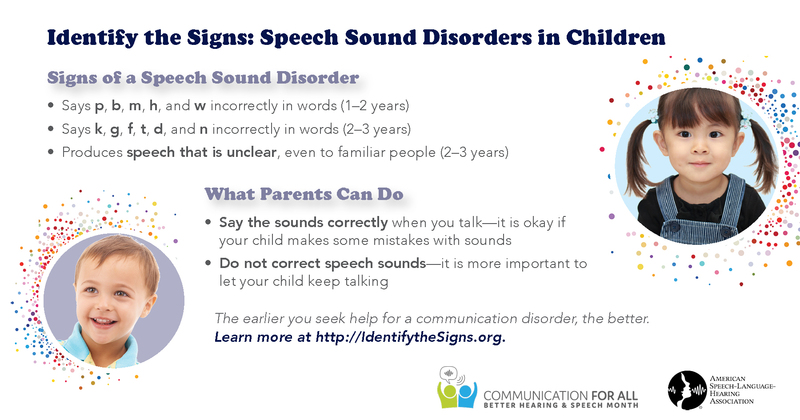 Only 12% say parents are generally acting within 6 months of first observing symptoms of a speech/language delay. On the hearing side, this number is only slightly higher at 20%. 70% say they don't think parents of young children fully appreciate how vital everyday communication--talking, reading, singing--is to their child's development. Yet they remain optimistic: 68% say they expect public awareness to improve over the next 5 years. "Our take-home message for parents is 'Don't delay if you have any question about your child's ability to hear, speak, or understand'," said Davis-McFarland. "Some of these disorders can be reversed or even prevented if a child is treated early enough. 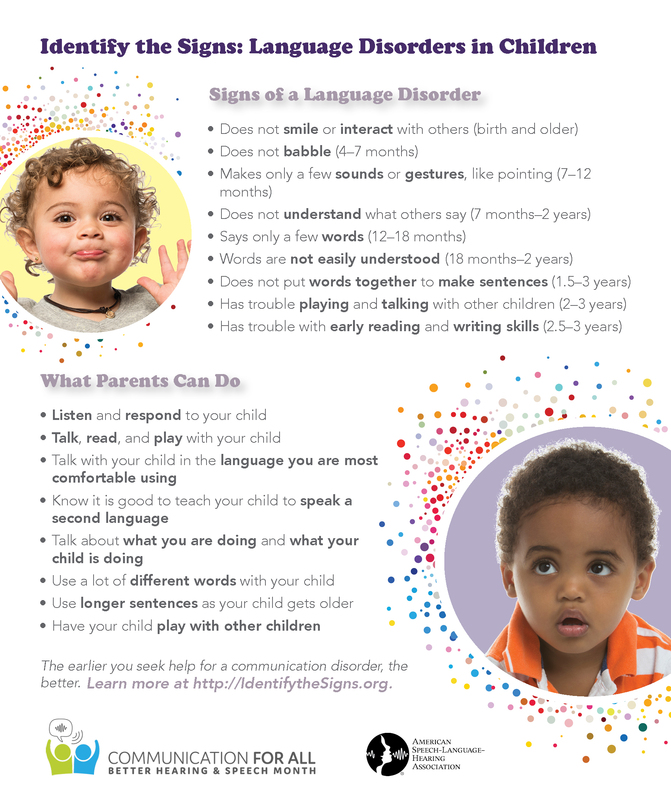 Parents should familiarize themselves with communication milestones--which are very specific and begin within the first few months of life--as well as the early warning signs of communication disorders, which can be subtle. 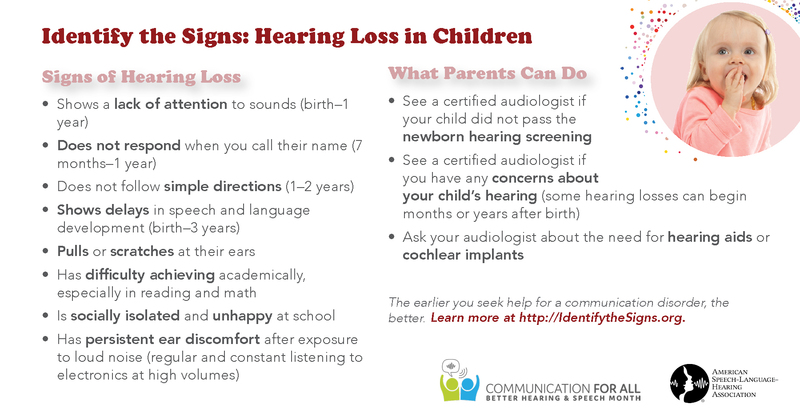 We encourage them to seek help from an ASHA-certified audiologist or speech-language pathologist if their child isn't meeting milestones and/or is showing warning signs." Learn more about these disorders and find help at http://IdentifytheSigns.org.